© Snowpiercer Film, all rights reserved. Image grab. Snowpiercer is rated R for violence, language, and drug content. We are in the midst of Advent: the season in which the church both celebrates the birth of Jesus and longs for his return. During this season we are inundated with holiday films and television specials about the magic of Christmas. Yet what holiday special reveals our hopes for this world to be rolled up like a ruined garment and replaced? That Advent longing is sadly missing in much of our Christmas culture, a culture expecting us to pull ourselves up by the bootstraps and unearth the goodness surely buried in every heart. To this Christmas culture I offer Snowpiercer as a tonic. Snowpiercer is a dystopian narrative about Curtis (Chris Evans of Captain America fame), a downtrodden resident of the eponymous train. 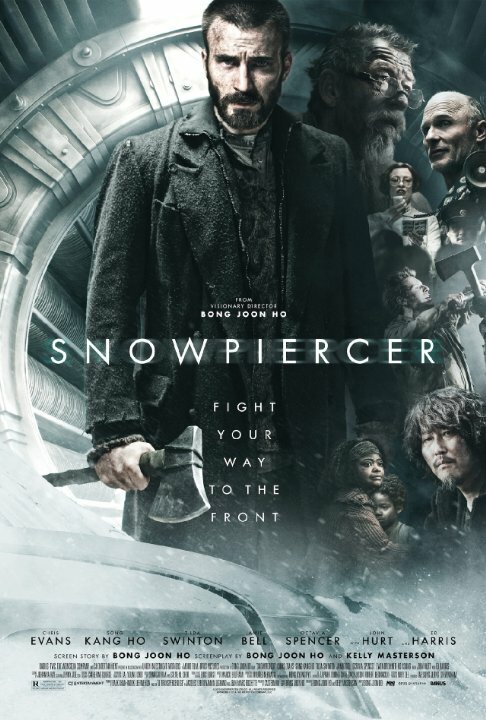 Snowpiercer is an ark that salvaged a remnant of the human race from a self-inflicted apocalypse and whisks them around the uninhabitable, snow-bound planet. A pervasive and yet unseen mastermind governs the train. In classic dystopian fashion, the system is effective, even elegant, and utterly dehumanizing. Snowpiercer is not a Christmas story, but it is a deeply theistic one. It’s a story that unexpectedly pierces the heart of Christmas to get at a very Advent longing. Presented as allegory, each element of the story functions as a microcosm of our world. The airtight system of the train holds humanity, sharply divided and deeply interconnected; it’s globalization shrunk down to snow-globe size. Crystalizing the concept of economic scarcity, the elite feast at the zero-sum expense of squalor for the rest. A police state inflicts this tenuous balance on the trampled through propaganda, deprivation, and brutal behavior norming. The rhetoric of the elite reeks of privilege and pomposity. “We must all of us on this train of life remain in our allotted station. We must each of us occupy our preordained particular position.” This ideology becomes harder and harder to swallow as the narrative reveals the cost of the elite’s preordained particular position: subjugation of the entire class of maimed people (whom you suspect were intact when they boarded the train). The metaphysical and positional antithesis of the steerage-class caboose of the Snowpiercer is the engine, the holy of holies on this locomotive ark. Its perpetual motion is the essence of eternity. The elite revere the engine, their consolation in this ruined world, the logic behind their atrocity. Curtis respects the engine as the means to power and a reordering of justice in his favor. And the unseen presence occupying the engine? He’s a man-god named Wilford. The merciful giver of life and heir of all things, his powerful word keeps all in place with terrible sovereignty, interceded forth by a hideous priesthood. A crucial bit of tension runs through the heart of the narrative. In our post-Wizard of Oz imagination, we wonder what Curtis will find when he reaches the engine. What’s behind the curtain? Is it truly divine? Or is it a merely human construct securing the powerful, and therefore a system replaceable with something better? This tension, at last, opens our window on Advent longing. In dystopian narrative, something has gone disastrously wrong in the world, and some person or party has risen to salvage humanity, but at great cost to some. It’s the pattern of 1984, A Handmaid’s Tale, The Hunger Games, and dozens of other recent films. Dystopia often depicts a quasi-religious kingdom that demands fealty before the god of the state. This god certainly demands an awful amount of blood, because its acolytes must deploy the police state to shore up its powerlessness to control the heart and mind through law. Transcendence is bound up in service to brutality. Yet people are haunted by memories of something better, unable to shake the feeling that civilization can’t come at the expense of the dignity of the individual. The belief in a better way drives dystopian narrative. In that sense, dystopia and Advent are perfectly wed. We live in a world in which something has gone disastrously wrong, and we long for a good King to reign with a perfected paradox of justice and mercy, restoring our inner deep and our society. We have long endured all-too-human systems attempting to stand in for our banished King. Every episode in the long succession of regimes and revolutions has been both haunting and haunted. Haunting in its slowly unfolding prejudices and tyranny, and haunted by a memory, experienced as a foretaste, of that elusive better way. We cannot shake the feeling that we are each more than a disposable part in an economic and political machine. Dystopia resonates with us because it is a Technicolor version of what is already true. Like the citizens of dystopia, we long to return to Eden, but the way back is guarded by a flaming sword that frustrates our quintessentially human religion of politics and policing. Into this our dystopia a child was born to open up the narrow gate through which we would find our way to something beautiful, something dignified, something just, something free. So Advent meets us in the second act of our dystopia, bound to injustice and tyranny yet having heard of the way out and, taking it on faith—waiting, hoping, longing for our King, that same child, to crumble the walls of a broken system with a shout like a trumpet. This, though, is where Advent and Snowpiercer part ways. Unlike Curtis, we don’t act out our longing for a better kingdom by plotting to take over the train. We act out our longing by living as though the kingdom had already come, as though we were already restored. It has and we are, though still we wait. The discomfort we endure constantly reminds us of our eager expectation. This, then, is the beautiful promise of Advent: because God was gracious enough to enter our dystopia, we can persevere, looking forward to the end of the succession of manmade gods and haunted paradises, awaiting the re-arrival of the God-man Jesus Christ and his long-expected kingdom. Come, Lord Jesus! Michael Morgan lives in Louisville, Kentucky, with his wife and two sons. He is a member of Sojourn Community Church, where he serves as a community group leader and as part of the worship team. You can read his blog and follow him on Twitter.